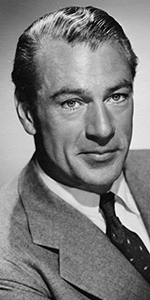 Gary Cooper was one of the most successful leading men of the Golden Age of Hollywood. Coming to prominence in the early sound period, "Coop" brought a new kind of naturalistic acting to the screen, allowing him to appear in films of all kinds. Twice winning the Oscar for Best Actor, Cooper was tremendously well-liked and respected. Born to English immigrants, Cooper's father owned a large cattle ranch, where he and his brother learned all of the tricks of the cowboy trade, while also going to school in nearby Helena. During his ninth year, he was educated at Dunstable Grammar School in Bedfordshire, England, which gave the young fellow a polish not usually found in frontier types. Back in Montana at age eleven, Frank's English teacher got the young boy interested in academics; Cooper joined the debate team. Breaking his hip at age fifteen, doctors suggested hourseback riding as therepy, giving Cooper his trademark walk and riding style. An interest in art led to Grinnell College, but the drama club did not want him. In 1924, the family moved to Los Angeles, where friends introduced him to the film folk making westerns. Intending to save for college, Cooper did extra and stunt work. 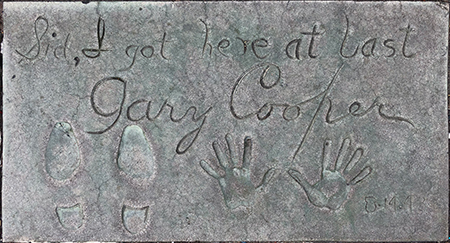 Knowing the dangers of stunt work, Cooper hired an agent to try to get him acting roles; Nan Collins suggested he change his first name to Gary. By 1926, he had a contract with Sam Goldwyn for fifty bucks a week. He played a piviotal role in The Winning of Barbara Worth (released in October, 1926), and was able to wiggle away from Goldwyn to Paramount, where Clara Bow chose him for roles in both Children of Divorce (released in April, 1927) and Wings (released in January, 1929). By now, Cooper was headlining in his films, doing several silent features before making his first sound picture, The Virginian (released in November, 1929, after which he made a number of westerns. But after being cast with Marlene Deitrich in the romance Morocco (which had its Hollywood premiere at the Chinese in November, 1930), he clashed with director Josef von Sternberg, and became something of a heartthrob in the process. He appeared as the hero in the first film adaptation of a Hemingway novel, A Farewell to Arms (released in December,1932), which became one of the big hits of the year. He then accepted a role in Design for Living (released in December, 1933) based on the Noël Coward play. Cooper was so busy, he made many more films than we have room for, but some of the more notable are: The Lives of a Bengal Lancer (released in January, 1935, Mr. Deeds Goes to Town (released in April, 1936); he played Wild Bill Hicock in The Plainsman (released in November, 1936). At this time, Cooper accepted a huge offer from Sam Goldwyn, but Paramount brought suit with the court ordering the actor to work for both studios. This new work schedule resulted in Beau Geste (released in July, 1939), and The Westerner (which pllayed the Chinese in October, 1940). Cooper then signed with Warner Bros., where they had a slew of projects lined up, including: Meet John Doe (released in May, 1941), and the biopic of World War I hero Alvin C. York in Sergeant York (released in September, 1941), which brought Cooper his first Oscar. Pride of the Yankees (released in March, 1943) had Cooper playing Lou Gehrig, which became the biggest hit of the year, then he went back to Paramount; the studio had bought the screen rights to For Whom the Bell Tolls, (released in July, 1943), where Cooper and his pal Ernest Hemingway were able to get Ingrid Bergman cast as Maria. It was after Tolls had been released that they had Cooper down to do his footprints in the Forecourt. He co-starred again with Ingrid Bergman in Edna Feber's Saratoga Trunk (released in March, 1946), then starred in King Vidor's odd film about an architect, The Fountainhead (released in July, 1949). Fred Zinneman's low-buget western High Noon (released in July, 1952), brought Coop his second Oscar for Best Actor. In The Court-Martial of Billy Mitchell (released in December, 1955), Coop played the early Air-Force booster, while in Friendly Persuasion (released in November, 1956), he played the Quaker patriach of a large family in time of war. Man of the West (released in October, 1958), was one of a passel of westerns Coop made toward the end, while his final film, The Naked Edge (which had its world premiere in Helena, Montana in June, 1961), was a thriller. Gary Cooper had been battling prostate cancer for the last few years of his life, receiving visits and telephone calls from Queen Elizabeth II to President John F. Kennedy. He died from the cancer at the age of 60. Grauman's Chinese Theatre, Hollywood, California. Cary Cooper Forecourt ceremony, Friday, August 13, 1943. 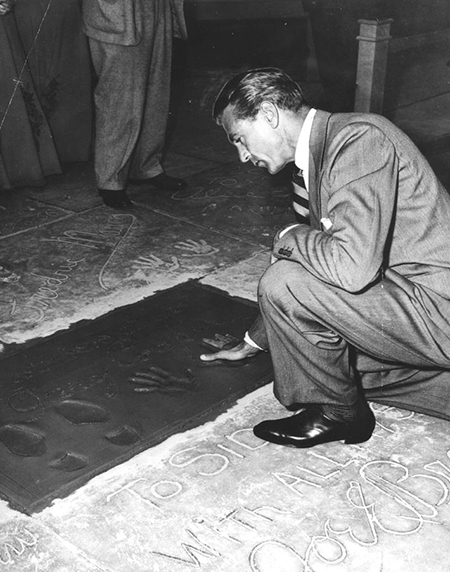 Gary Cooper contemplates his handiwork after leaving his imprints in the cement.